Treat the office to a gourmet, heavenly surprise with a Scarlet Magnetic Closure Keepsake Box to delight their taste buds. Dimensions: 7 3/4" x 7 3/4" x 2 1/2"
The large, elegant, magnetic closure gift box will be perfect for keeping small treasured items, either in the office or at home. We foil-stamp your logo in gold or silver on the lid of this leather-like box. 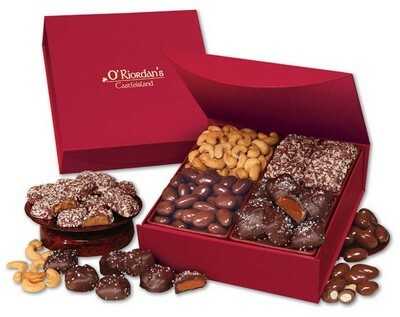 It's filled with an incredible assortment of gourmet treats including Chocolate Sea Salt Caramels, English Butter Toffee, Chocolate Covered Almonds, and Extra Fancy Jumbo Cashews, over one and a quarter pounds in all. This gift is guaranteed to bring a smile to their face! Other food combinations are available, contact factory.